Why Can’t Americans Drink in Public? It’s a simple question. Think about it: As Americans, we have a lot of freedom. Freedom to shoot our mouths and guns off, freedom to drink booze, practice any religion we want, criticize our government, and much more. And unlike Germany, we even have the freedom to brew whatever crazy beer we want and call it “beer”. 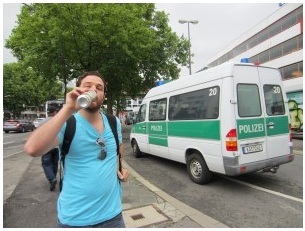 However there is something that Germany’s got that we don’t: The right to drink in public. And we’re not talking about shamefully hiding your drink in a crinkled up brown paper bag in some shady back alley, cowering under the disapproving glares of others. No, we’re talking about confidently strutting down the street in broad day light, head held high, drink in hand, and no one giving a second thought about it, not even the police. It’s normal. It’s socially accepted. It’s legal. And it’s not just a thing that teenagers or tourists do. Doctors, teachers, and lawyers do it. Men and women. Young and old. And no, you’re not considered a low life drunk for enjoying a refreshing beer while waiting for the bus. As a matter of fact, in Berlin and many other German cities you can go right ahead and take that drink with you on the bus, or any other public transportation. It’s perfectly legal. And if you think Germany’s the only country in Europe with lax open container laws, think again. Belgium, Austria, Switzerland, and Portugal do not have any laws against drinking in public. 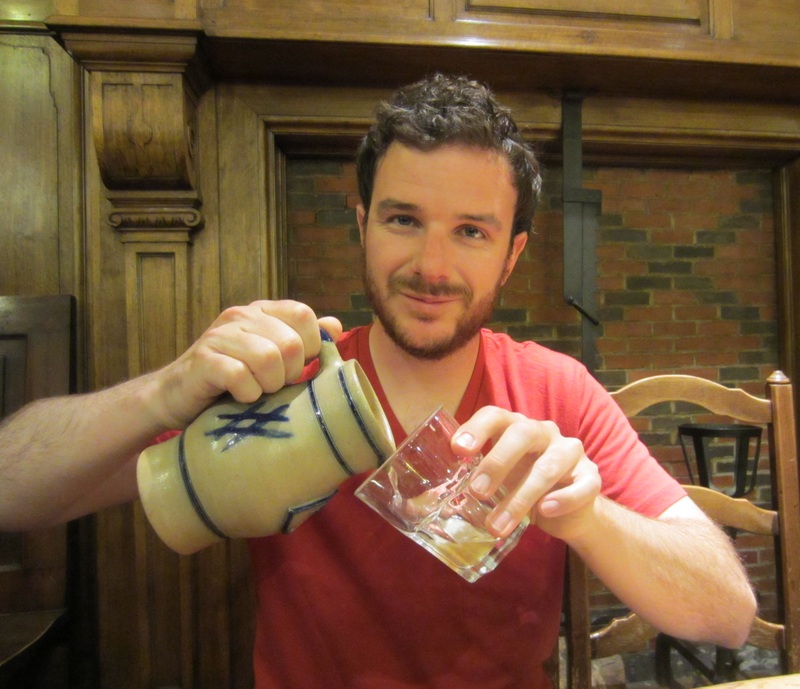 In most other European countries, it’s legal to drink in public with certain minor restrictions. 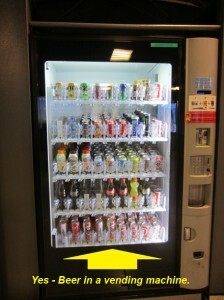 The attitude is so laissez fair that you can even buy beer from vending machines. I’ll admit it: I’ve got freedom-envy. Why should other countries have more freedom than we do? Land of the free, home of the brave? It’s our freakin’ catch phrase for crying out loud. Freedom is what we do. It’s who we are. It’s our thing. We stick up for other people’s freedom, and we die for ours, so why can’t we have a cold beer on a hot day on the street? Would it really offend you? Maybe we have our priorities a little mixed up when we as Americans are trusted to act responsibly with guns in public, yet not with a glass of beer. To be fair, there are a handful of places in the U.S. that do allow drinking in public in some form or another including Las Vegas (on the strip), Butte, MT (between 8 am and 2 am), Sonoma, CA (between 11:30 am and dusk), and certain areas in New Orleans (French Quarter), Memphis (Beale Street), Kansas City, Savannah, GA (Historic District), Erie, PA (70 block downtown district), Gulfport, MS, Hood River, OR, and at least two places in Texas: Fredericksberg (beer & wine in a plastic cup) and Fort Worth (The Stockyards area). As it stands, there is no federal ban on the possession of open alcohol containers in public, so it is up to the individual states to call the shots. For the states that don’t have state statues making it illegal to drink in public, they pass the decision-making buck to the smaller municipalities or localities. The following states do not have state statues against drinking in public: AK, DE, FL, HI, ID, IL, IN, LA, MA, MN, MT, NV, NH, NJ, NY, ND, OR, PA, RI, TN, WI, and WY. Not to leave anybody out, there’s also no ban in Guam, Puerto Rico and the Virgin Islands. In other words, if you’re inspired to make it legal to have a drink while you’re strolling down the street, your starting point is with your municipality, locality, county or town. In these cases, you’ll want to get in touch with your local councilman, supervisor, alderman, mayor, or county executive. To prepare a bit, take a look at current cities/municipalities in the U.S. that allow public drinking to see how their governments handled the issue. On a funny side note, California’s state statue indicates that it’s only illegal to have open containers of alcohol IF the city or county has an ordinance prohibiting it. Sort of like when Mom used to say, ‘I’m OK with it just as long as your Dad isn’t against it.’ So since the city of Sonoma doesn’t have a ban on drinking in public (you are allowed to drink in public between 11:30 am and dusk), the state of California doesn’t have a problem with it. Now, if you happen to reside in a state that does have a state statue against drinking in public, your local state senator, assemblyman, or state house representative is the person to talk to. While you’re at it, take a look at what Ohio state is doing with Senate Bill 116 in its attempt to legalize public drinking within “outdoor entertainment districts” thereby promoting tourism and economic development. All the legal language and process is there. Copy, paste, change names, submit. AL, CO, MS, NE, and TX already have what Ohio’s hoping to obtain which are state statutes specifically allowing for public drinking in specified entertainment districts or areas. In any case, it doesn’t hurt to drop a line to deep pocketed alcohol distributors who have a political arm, like your state’s equivalent of the California Beer & Beverage Distributors political action committee, who might have similar interests as you and the money to support your campaign. Even a coalition of forward-thinking local restaurants and bars could form a lobby for support after seeing the benefit of revitalizing your city center by attracting more dollars and promoting tourism if laws permitted their customers to walk away from their establishment with a cup of an alcoholic beverage with their logo on that they just served you. Just to be clear, I’m not advocating public drunken disorderliness, or getting loaded and driving. I’m talking about having a drink in public legally and not feeling awkward about it, while at the same time helping struggling towns and cities revitalize and generate some more tourist dollars. It’s already happening in cities across the U.S. to great success like on Beale Street in Tennessee (now Tennessee’s # 1 tourist destination), so why not run with it and make it happen in your town? Who knows, maybe they’ll name a park after you— a park you can legally have a beer in.